The Legend Of Zelda: Breath Of The Wild Review - Awe And Wonder — GamingWithSwag.com - Dads By Day, Gamers By Night. High Level Premise: Link must defeat Ganon, save Princess Zelda and the land of Hyrule again. Graphics/Style: High Definition cel-shading, outdoors mixed with medieval themes. Music/Soundtrack: Generally peaceful, no annoying, repeating overworld theme. Very relaxing during exploring. Voice actors for almost every main character, except Link. Story: It's been 100 years since Calamity Ganon took over Hyrule, now it's time for a hero to reawaken from a deep slumber. Only Link can stop Ganon and rescue Zelda and the people of Hyrule. Replay-ability: Moderate, and I say that purely from a story point of view. There are tons of side missions, including one to complete your encyclopedia by taking pictures of every object Link finds during his quest. Time Commitment: Phew. There is easily over 100 hours of content here, but you can do short playthrough sessions and save at almost any point during the game. Value: Easily worth the $59.99 no matter which system you purchase Breath of the Wild for. The Nintendo Switch has a slightly better framerate in some areas, but the WiiU version isn't gimped by any means. Favorite Element: Climbing a giant mountain or tower, exploring the land around it, and then soaring through the sky with your gliding device. Breathtaking. See that mountain in the background? You can climb that. I consider myself to be a pretty big Legend of Zelda fan. I place an exceptional amount of faith in Nintendo to treat one of their most prized franchises as not just a video game, but a work of art. Since being announced at E3 in 2013 for the Nintendo WiiU, fans of the Big N have been thirsty for a brand new Zelda adventure on consoles. Boasting an overworld play area that is larger than Skyrim, The Legend of Zelda: Breath of the Wild is the biggest Zelda adventure yet in multiple ways. I never knew I would experience such a jaw-dropping world to explore, in fact I can honestly say I have not had this feeling of awe and wonder since Ocarina of Time was released on Nintendo 64 back in 1998. One of the villages that Link will have to explore carefully, many secrets are hidden! In 20 years a lot has changed for Link. Gone are the small compact labyrinths where the standard "get weapon, defeat boss" format applied. Enter over 100 shrines with different trials of logic, strength, and cunning to complete. Different biomes span Hyrule such as desert, jungle, snowfield, mountain ranges and more. Every area that you can see in the distance is actually reachable. There is no mountain to tall, volcano too hot, as long as you have the right equipment to make it through the area. And that is another area that has changed. When traversing the vast land of Hyrule, you must factor in things like the temperature of the area, weather conditions and how much sound you are making around enemies. These things while seemingly are so insignificant, contribute to making Breath of the Wild the masterpiece it is. The Gerudo desert area will overheat Link during the day and make him freeze at night. Concocting a dish or an elixir with a special effect to combat this extreme change in temperature. The additional features added to this adventure that differ from past Zelda experiences really shine here. Cooking is an essential part of the game right from the start, as Link must find ingredients like mushrooms throughout the land, or monster parts from defeated enemies to brew elixirs. When Link finds a specific type of ingredient and it is cooked, it can provide a special effect to the dish to assist in his quest. Maybe adding a chili pepper will reduce Link's resistance to the cold weather. Or mixing in an endurance mushroom to improve Link's stamina for a brief period of time. Breath of the Wild also encourages people to talk to every NPC they can find, as in addition to side quests and hints they may also provide secret recipes for more effective edibles and elixirs. The stamina wheel provides Link with the ability to run, climb, paraglide and other strenuous activities. While Link can traverse anywhere in Hyrule, he will have to find specific paths that play to his stamina at the time. This stamina wheel can be upgraded by completing shrines that are scattered throughout the land. Calamity Ganon has ravaged Hyrule. But the main reason this game is so good, is that it encourages the player to explore. It is known almost right from the start that Calamity Ganon is the problem and you must defeat him. But other than that, very little direction is given to the player and that's an amazing thing. In a video game industry that is full of tutorials, hand holding, and icons on a map, Zelda does the opposite. This makes the world seem infinite, and encourages the player to check every nook and cranny. I have said to myself several times since the start of play "Wow, I cannot believe that was there." Speaking of which, just to give you an idea of how much there is to do in Hyrule, there are over 900 Korok seeds to collect, hundreds of objects to photograph, over 100 shrines to explore/solve, and a large amount of side quests to complete. Even if you went straight down the main storyline path and defeated Ganon, you didn't really "beat" Breath of the Wild. This game is about exploring, and remembering how much fun it was when you first popped in that gold cartridge for the first time and burned every bush and bombed every wall. The Legend of Zelda: Breath of the Wild is easily in my personal top 25 video games of all time, possibly even cracking the top 10. It's a work of art, and an experience that any player should experience at least once. The Legend of Zelda: Breath of the Wild available now on Nintendo Switch! Available Now! 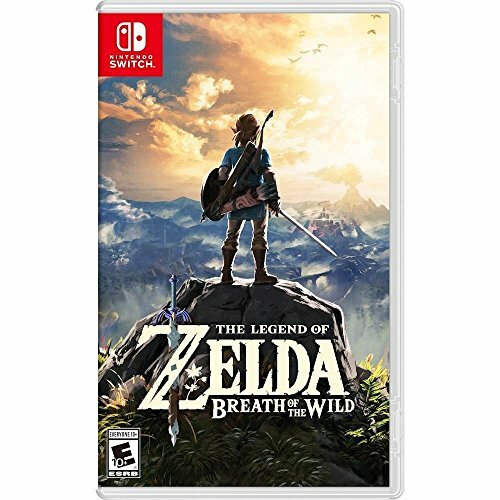 http://www.zelda.com/breath-of-the-wild/buy-now #NintendoSwitch #LegendofZelda #BreathoftheWild Forget everything you know about The Legend of Zelda games. 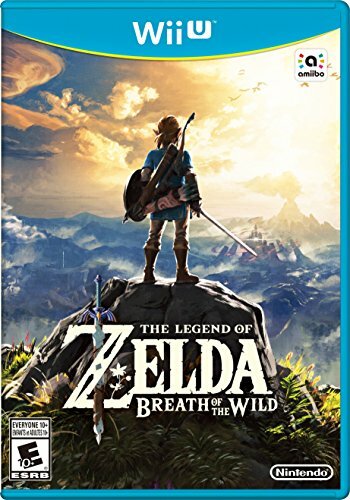 Step into a world of discovery, exploration and adventure in The Legend of Zelda: Breath of the Wild, a boundary-breaking new game in the acclaimed series.